To preserve, place, and promote the BLM curly mustangs. Solicit members to assist the association in fulfilling its mission statement. Work with the BLM to identify and segregate BLM curly mustangs during the annual BLM gatherings. Assist the BLM in monitoring the wild BLM curly mustangs. 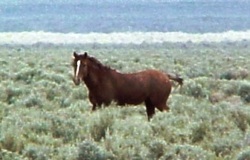 Set up a network of permanent and foster homes for captured BLM curly mustangs. Solicit charitable donations to a BLM Curly Mustang Fund within the ICHO to aid in the placement and promotion of the BLM curly mustangs and the ongoing research by Gus Cothran, Mitch Wilkinson, and others to identify the curly gene in horses. Maintain a BLM Curly Mustang site on the Forum as a focal point for BLM curly mustang owners and enthusiasts to communicate. Solicit hair and/or blood samples of BLM curly horses to assist Gus Cothran, Mitch Wilkinson and others in their ongoing efforts to identify the curly gene in horses.